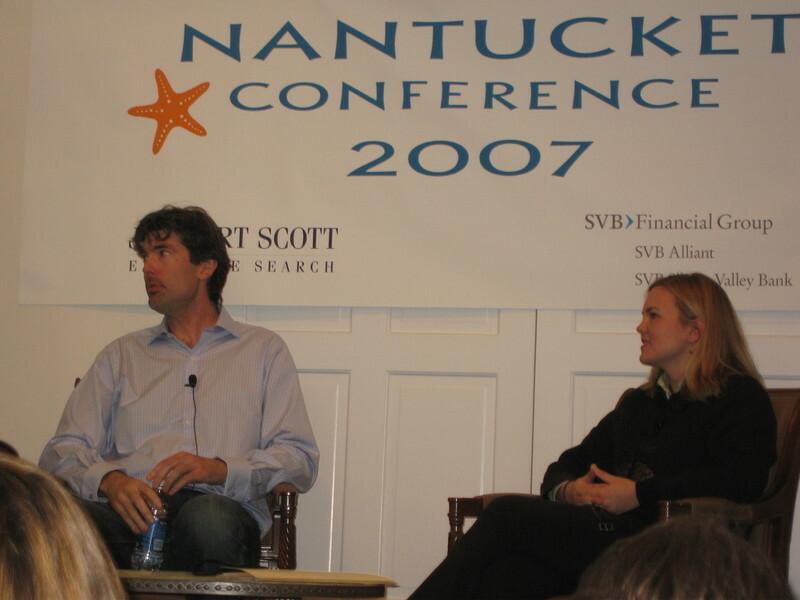 Jim Buckmaster, CEO of craigslist, did a “fireside chat” interview with BusinessWeek editor Jessi Hempel, at The Nantucket Conference. The conference, and especially this session, was thought provoking. I have interviewed Craig Newmark, founder of craigslist, and written about the craigslist concept several times. I found Jim Buckmaster to be the perfect match for Craig Newmark, and craigslist. He is genuine in his beliefs and commitment to the craigslist philosophy…just like Craig. These guys break all the traditional rules on how to run a company. I hesitate to call craigslist a company…it is really a community in every sense of the word. Surely the users are a community, but even the company itself seems to be run more like a community than a traditional company. Yet, craigslist has been more successful in terms of active users and revenues than probably 99% of all web based companies. There are lessons to be learned here. Lots of companies talk about listening to customers…craigslist really does. Craigslist could generate hundreds of millions in revenue and be a public company. Why haven't you done this? "You can't serve two masters. You either have to serve Wall Street or customers. We chose customers. Sure, we could generate more revenue, but we have enough to support the things we need to do." Have you considered advertising as a revenue stream? “Our customers haven’t asked for that”. Why not charge for job and real estate listings in other cities? Why just San Francisco and New York? “We would if our customers asked for that, but the community seems to be happy with the way it is”. What is on your product roadmap? “Multilingual support, better search, better spam and scam detection, less clunky geography browsing." Why not just crank up the revenues a little bit to hire a few more people so you could implement some of these features and more customer service now? “Well, every company has resource constraints. Sure we get frustrated sometimes, but even companies with 1,000 employees have resource constraints. So growing from our current 24 employees to 35 or 40 employees wouldn’t change things for the better…it would just make us bigger’. Luxury hires – Jim was asked how he spends his time. “Unfortunately we get lots of requests from law enforcement or government agencies. We need to respond…and this takes a lot of time, finding information, checking facts, and talking with lawyers. I don’t like doing it but it usually falls to me. It would be nice to hire a legal coordinator but that would be a luxury hire. We don’t do luxury hires”. The whole interview was fascinating, but two things really jumped out at me and they are applicable to every business of any size. Luxury hires and resource constraints. If we really stopped to think about it there are probably quite a few luxury hires that could be avoided in every group. In big companies there are lots of luxury hires walking around. The second eye opener was the notion that every company, regardless of size, has resource constraints. Craigslist has 24 people. Other companies have 2400 people, or 24,000 people, but no matter the size…they can’t do everything. They get bigger…not better. This sort of reminds me of The Mythical Man Month. Software projects are typically broken down into individual features and work estimates are expressed in terms of man months of effort. Conventional wisdom is that adding more man months gets the job done faster. The Mythical Man Month theory says that adding people to a project actually slows it down because of all the communication and coordination overhead. If a project is behind schedule you should take people off the project to reduce overhead and sharpen the focus of the team. Fascinating ideas. Craigslist does a pretty good job at customer service, Craig himself is a customer service person. You can never please everyone and resolve every issue no matter how many CS people you have. I remember at Napster we had 5 customer service people for over 40 million users. It was tough, but we did the best we could. We triaged the requests to the most important, automated email responses for frequent requests, and constantly updated the FAQ to help people. Free services can only do so much customer service. Even paid services like Google making billions of dollars have real challenges providing good customer service. Have you ever tried to contact Google customer service? re: "You can never please everyone and resolve every issue no matter how many CS people you have." P.S. craigslist is a very special case given its history and its claims (I don't think it can be compared with Napster or Google, in terms of what it owes the community that helped built it, develop it and spread it) D.